In a matter of 90 minutes, Gov. Jack Markell (D-Del. ), Republican Jeffrey Cragg and Green party candidate Mark Perri squared off at Tuesday’s Gubernatorial debate at Widener University in Wilmington. There were a variety of questions asked. Here’s a portion of some the candidates responses. At 8 a.m. sharp, the debate on some of Delaware issues began but before then, the candidates started with opening statements, that gave the audience sort of an idea of what they all stand for. “I think this election is about really one issue, it’s about jobs and about the economy. Here in Delaware we have over 30-thousand neighbors and friends who are unemployed, it’s an unacceptable number and I think we’ve had an inadequate response on this part of the state to putting people back to work,” said Republican candidate Jefrey Cragg. Next up was Green party candidate Mark Perri. Just before the debate, the candidates picked numbers one through three to decide which order the speakers would go in. “Climate change is already killing 400-thousand people a year and costing us 1.2-trillion dollars a year, we know our climate is broken. Our economy is based on burning fossil fuel and the problem is that’s killing the planet. Climate change is the most urgent and important issue confronting us,” said Perri. The Governor went last. “I’m proud how we pulled together these last four years. We’ve shown we really are a state of neighbors working together. We are reopening shuttered plants, we are putting people back to work and once again we are making Delaware a choice location for businesses to locate and to expand,” Markell said. After opening statements, that’s when the questions began. Amy Cherry of WDEL asked the first one. QUESTION #1: WHAT’S THE TIMETABLE FOR THE LEGALIZATION OF GAY MARRIAGE IN DELAWARE? AND WOULD YOU SUPPORT IT? After a number of follow-up questions regarding gay marriage. The next one focused on jobs. QUESTION: WHAT’S THE PLAN TO CREATE MORE JOBS AND LOWER UNEMPLOYMENT RATE IN THE NEXT 24 MONTHS? The rest of the questions are summarized but addressed other issues. QUESTION: SHOULD THE STATE STEP IN TO HELP THE CITY OF WILMINGTON FIGHT ITS ALARMING CRIME RATE? WHY OR WHY NOT? QUESTION: WHEN RACE TO TOP MONEY RUNS OUT, WHAT WILL BE DONE TO IMPROVE EDUCATION? QUESTION: DO STATE WORKERS DESERVE TO BE PAID MORE? At this time, Cragg took this time to shift the focus to union groups. All three candidates were given the same amount of time to answer questions as well as the closing statements where the men had one last chance to convince the audience. “I think this debate was a fine example of exactly where Governor Markell and I differ on the issues. I think the key point is where his heart is in the right place, the policies don’t bare out what he often says,” said Cragg. “No matter who wins the election in November, the price of oil will still mostly be set by other countries and if we really want to protect ourselves from high gas prices we have only one effective policy, extreme energy effiency.Republicans are in the pockets of the dying fossil fuel industry and the Democrats are afraid of them so we can’t expect their leadership,” added Perri. The Governor closed the debate and reminded voters to remember him on election day. “We’ve had tough choices to make over these last four years,we’ve made decisions that we believe were right for Delaware even when they were unpopular and we acted as if our very future was at stake because it is, and I’m proud of what we accomplished these last four years together, we’re moving forward,” Markell said. 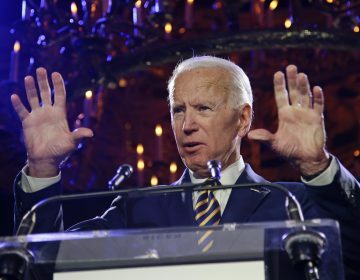 WHYY-TV will air Tuesday’s debate on Wednesday at 5 p.m. and again at 11 p.m.
Former Vice President Joe Biden finally makes his presidential ambition official after indicating for weeks that he would run for the third time since 1988. 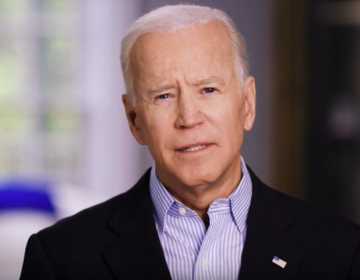 Joe Biden is making his third presidential run after two disappointing campaigns in 1988 and 2008. Will his history of putting his foot in his mouth come back to bite him? 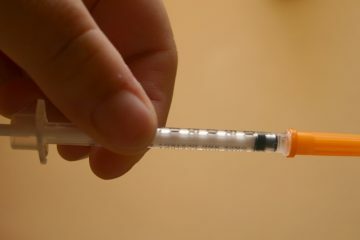 Diabetes and other injection-drug users looking for a safe way to dispose of used needles can do so Saturday on Drug Take Back Day in Middletown, Delaware.